This system is a complete Internet Telephony Service Provider platform refereed in this manual as Partner Portal. It lets Partners control all aspects of their communication platform such as branded website (web product), pricing, customers, end users, SIP endpoints etc. Partner Portal is optimized for a screen resolution of minimum 1024 x 786 pixels. Figure 1.1 Reseller platform - overview. 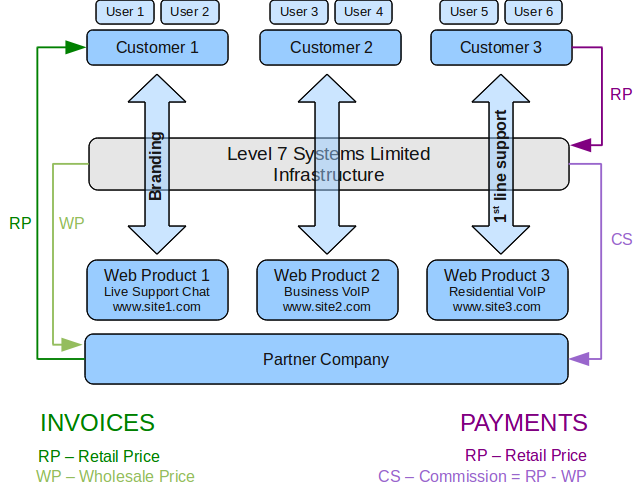 Above diagram illustrates relations between Partners, Customers and Level 7 Systems infrastructure. Web Product is a branded website hosted on Level 7 Systems' platform which offers communication services to Partner's Customers. Partners may create as many Web Products as they require. Level 7 Systems will also provide branded software (for example IM client, softphone etc.) and manuals as a part of your Web Product package. Customers (a company - business customer; individual - residential customer) is an organization/person using services provided by you (Partner) via Level 7 Systems infrastructure.